Post-pitch exhaustion: do our big ideas ever become a reality? Newcastle looks as if a bomb has hit it. 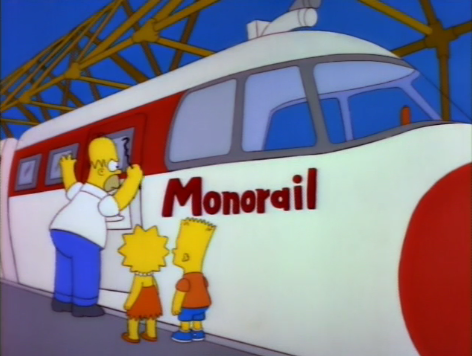 But before you close this tab thinking “ugh, complaining about light rail construction is so September 2017”, you may be surprised to read that I’m not in fact alluding to the current construction taking place in the inner CBD. Instead, I’m looking upon the aftermath of a city constantly under fire from idea bombs, pitch-fest projectiles, hackathon hand grenades, creative talk torpedos and any other military themed simile you can dream of for these networking nuclears. Our city seems to be a sitting duck to these sort of after-work social events that aspire to fight in the name of whatever might buzz best, and over the past couple of years, this has been defined by visions of Newcastle as a world class ‘smart city’. In my years as a communications nerd living and working in Newcastle, I’ve observed few visions for the city that have been defined by such a broad-spanning term - well, second to putting the word ‘new’ next to everything that is. Although at least with ‘new’, it’s simple enough to align the marketing with projects that are in their first iterations within the city. ‘Smart’ on the other hand raises more questions than a small smart community could possibly provide answers to. It’s quite telling when one Google search for the definition of a smart city returns results from Techopedia, Business Dictionary, Centre For Cities and Science Direct all on the first page. This idea is so multi-displinary that you could construct an entire university off the back the research opportunities; and many in Australia are already doing so. In our own city’s case, it’s perhaps best to look at the term through National Geographic’s eyes, seeing as they’re the ones who were responsible for naming us one of the world’s seven smart cities that have “risen to the challenges of 21st century urban life”. In the words of National Geographic Traveler Editor and Chief, George Stone, “Newcastle is a city where innovation is visible at every corner and where both locals and visitors benefit from the place-making strategies that bring together public and private interests;”. You needn’t have to attend an Ideas Bombing event to know that Newcastle faces “challenges in 21st century urban life”. You and I experience it on our commute - or perhaps there lack thereof - to work everyday. With this said, on the other side of the coin, weekly pitch-themed events remind us of how many individuals, collectives, start-ups, and those in between that are genuinely thinking outside of the box within their sectors and are passionate about enacting innovative solutions within our direct community. Last week, I attended an IQ Ignite event which explored the topic of how to ‘hard-wire’ Newcastle’s creative capacity. Aside from an unforgettable live performance from two musicians representing UoN’s Bararya Records, I found researcher Kara Sullivan’s findings in public transport use to have made a lasting impression. Her co-presenter shared plans for tech-integrated smart bus stops and autonomous transport. In contrast, Kara followed the experiences of a sample of Novocastrians who (like the majority of the population) didn’t typically use public transport. In doing so succeeded in highlighting some very significant, smart realities. I haven’t tried too much modern VR tech, but I imagine Tom’s experience comes pretty close. Although current technologies continue to make the future cities envisioned by the likes of Spielberg and Ridley Scott an oncoming reality, the need for solving basic but essential problems is still prevalent within our community. Connectivity and resource management still has a long way to go before we might consider labelling ourselves as smart about it. Better lit, attractive, and comfortable bus shelters are important but before this new infrastructure can be built, pre-established mobility services need to be intelligently considered. We needn’t have to re-invent the bus, train, bike, or car wheel to establish a more efficient and sustainable system of getting from A to B. The carpark sensor-data of Foresight Parking worked in not only revealing the real-time capacity of car park locations across the city, it also created the opportunity to establish a user-friendly live data app for citizens to access. Borne from our desire to create civic efficiency through long range, wireless connections, NewieVentures voluntarily developed and installed the parking sensors to unlock data that could inform our city’s resources now and moving into the future. It’s through the same passion to see a smarter, more data-informed city that The Things Network Newcastle Lake Macquarie community continues to work in achieving through its swift, continuing expansion. I’ve always remembered something Renew Newcastle’s general manager said to me at a creative city event: “Newcastle isn’t lacking in good ideas. Getting people to make them happen, that’s the difficult part”. I’m sure this principle rings true in many cities although I feel Newcastle - perhaps equally through the exhaustion of hearing the ideas of others and a growing enthusiasm to collaborate and make them happen - are getting things (Internet of Things and otherwise) done, quick smart. 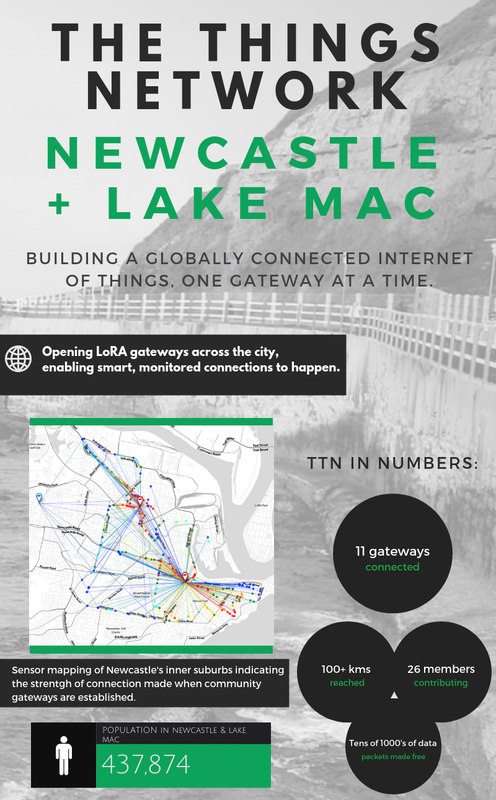 Discover more about the TTN Newcastle & Lake Mac community here and join the IoT movement in our region!